Among the officers, too, there were many whose experience did not include duty afloat, these were, for the most part, the junior officers who had just completed their education as reserve midshipmen. The Captain was a veteran of thirty years in the naval service, this ship being the eighth he had commanded. The Executive Officer, Commander George Willcox, of Annapolis, Md., had just returned from more than a year as First Lieutenant of the USS Essex. The Chief Engineer, Commander Alexander H. Hood, had spent the preceding four years afloat. 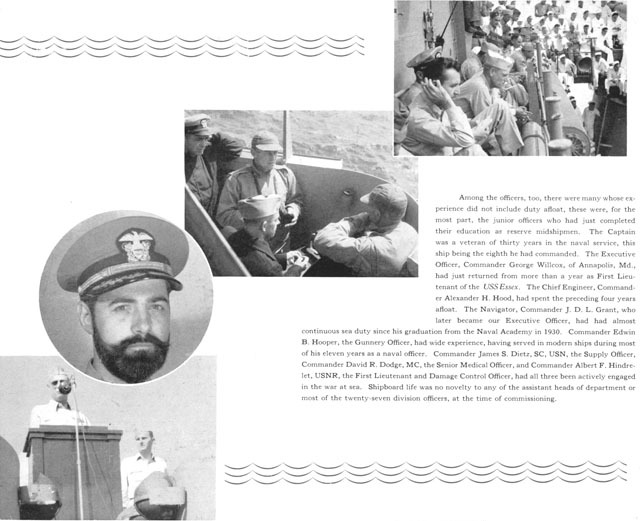 The Navigator, Commander J. D. L. Grant, who later became our Executive Officer, had had almost continuous sea duty since his graduation from the Naval Academy in 1930. Commander Edwin B. Hooper, the Gunnery Officer, had wide experience, having served in modern ships during most of his eleven years as a naval officer. Commander James S. Dietz, SC, USN, the Supply Officer, Commander David R. Dodge, MC, the Senior Medical Officer, and Commander Albert F. Hindrelet, USNR, the First Lieutenant and Damage Control Officer, had all three been actively engaged in the war at sea. Shipboard life was no novelty to any of the assistant heads of department or most of the twenty-seven division officers, at the time of commissioning.